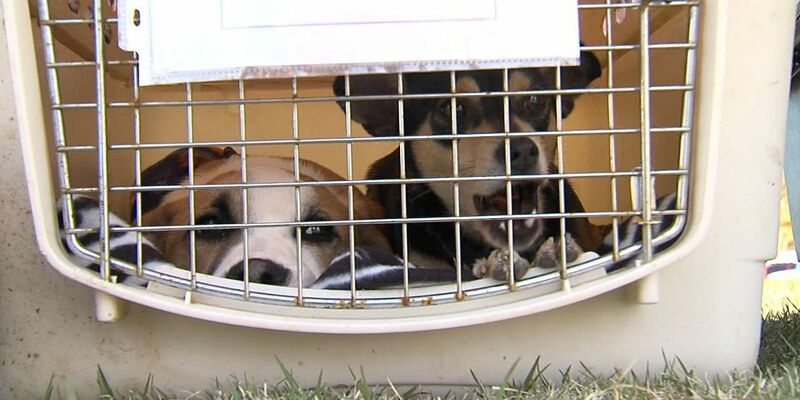 OKLAHOMA CITY, OK (KSWO) -Dozens of cats and dogs from across the state, including some from Southwest Oklahoma, got on a plane in Oklahoma City in hopes of them finding forever homes. Animals from about 20 rescues and shelters showed up Tuesday morning as part of the nationwide Wings of Rescue flight. This is the second flight to take off from Oklahoma since it started in Oklahoma in February. Organizers hope the project will cut down shelter overpopulation, ultimately keeping more animals from being euthanized. Rescuer Dayna Mann, from the Ponca City Humane Society, says they brought six dogs to go on the flight. "I hope they find a wonderful home, are spoiled and just loved, you know, forever. They deserve the best. You know, they deserve to be spoiled just like little Jojo here," Mann said. Mann says this will free up space at the humane society so they can rescue more dogs from shelters. Director of Fetch Fido a Flight Vikki Smith says she was shocked after moving here June 2015 only to find out how the animals were legally allowed to be put down in our state. "Heart stick and gas chamber and gunshot. It's all legal here in Oklahoma and I said somebody has got to do something and one day I realized I am somebody and I'm going to do something, so I contacted Wings of Rescue and asked them to come help us," Smith said. Smith say these 65 dogs and cats are going on a flight to the Pacific Northwest where they'll get a second chance at life and finding new homes. "They have a wait list for adoptable dogs because they have excellent spay and neuter laws and they have their population under control," Smith said. Animals of all ages took the six- to seven-hour flight to Washington. There they were met by shelter organizers when the plane touched down on the tarmac. Smith says her ultimate goal is to save the lives of 100 animals each month through Wings of Rescue. "The most exciting part of this is watching what would have been euthanized get on this plane to go to freedom, and I get to see the shelters on the other end send me pictures of these dogs with their adopting family," Smith said. These rescue flights are strictly donation based and cost $14,000. If you would like to make a donation to save Oklahoma animals, check out their website. On February's flight, about 90 percent of the animals were adopted out within 24 hours of arriving in the Pacific Northwest.